I first heard about the Kröller-Müller Museum eight years ago. A colleague at 180 (remember those days?) came into work on a Monday morning raving about the experience she’d had at Kröller-Müller over the weekend. I was told that the museum was surrounded by an expansive national park that you could explore by bike, and that the museum itself had a vast collection of art in addition to a lovely sculpture garden. It sounded like an idyllic day trip, and I’ve now had ‘a visit to the Kröller-Müller museum’ scribbled on my Dutch to-do list for more than 7 years. Each time a visitor came to town, I would coax to see if there was any interest in a cultural day outside of Amsterdam. But the train ride to the east of Holland always seemed a bit too long for my out-of-town guests, who always seemed to be more interested in exploring the Rijksmuseum and Ann Frank House within the city. And just when it seemed like I might never make it to the Kröller-Müller Museum, Kai finally agreed to take the leap with me! I was about to leave town for two weeks, and Kai and I had one final Sunday together. We had recently been turned on to a car sharing service in Amsterdam, and so we decided to escape the city and find a quiet nook of the Netherlands where we could enjoy each other’s company before I left. We contemplated the beach, as the weather that day was lovely (no jackets in mid-October for the win!) but then I remembered the Kröller-Müller Museum high on my list, and the day slowly evolved into a cultural outing. We packed a picnic, pre-booked in our car so we could hit the road early, and started our trek at around 9am. The museum is just over an hour’s drive from Amsterdam, but if you elect to take the train, it’s a bit more complex and will take closer to two hours with a few stop overs. The museum is open Tuesday through Sunday, 10am-5pm, so keep that in mind in case you have an inkling to go on a Monday! By the time we arrived, paid to get into the national park, and found our way into the museum, Kai was starving, and so we got a cake and a coffee and hung in the cafe before starting to properly explore the museum. Which already gave us a taste of what was to come . . . literally! Loved this Piet Mondrian cake creation! The cost to get into the museum was €19, and we also had to pay a small fee to drive into Hoge Veluwe National Park. That said, the scenery is lovely, and there are free bikes scattered all around the park and museum, so the prices were quite justified. I recently got a museum card, and was excited to hear that the Kröller-Müller offers a discount to card holders, and my next visit will only be €9 – score! The museum’s big draw is the Van Gogh collection – it has the second largest Van Gogh collection in the world, after the Van Gogh museum itself in Amsterdam. I loved the layout and design of the museum – it felt modern and contemporary, which was a stark contrast to a lot of the art on display and the types of museums you typically find in Amsterdam. The lighting was impeccable with a flood of natural rays pouring in through ceiling windows, allowing visitors to view the art with great clarity. I picked out six or seven pieces I would have loved to take home, and was surprised to learn that the museum was actually founded by a private art collector, Helene Kröller-Müller, who is today credited with being one of the first collectors to recognize the genius of Van Gogh. There are now many other artist’s featured in the museum, ranging from Picasso to Signac. Some of the most notable works include van Gogh’s Potato Eaters (which I swear I saw in the Van Gogh Museum 10 years back), Pablo Picasso’s Violin, and Piet Mondrian’s Composition with Red, Yellow, and Blue (above). My favorites always tend to be still lives of flowers. And I found this darkened forest especially captivating. Afterwards, we went for a long stroll outside, through the sculpture gardens. Stopping for a few quintessential photo moments ;) We left the museum after an hour or two, ready for our picnic lunch. Which required us to find the perfect picnic lunch spot. 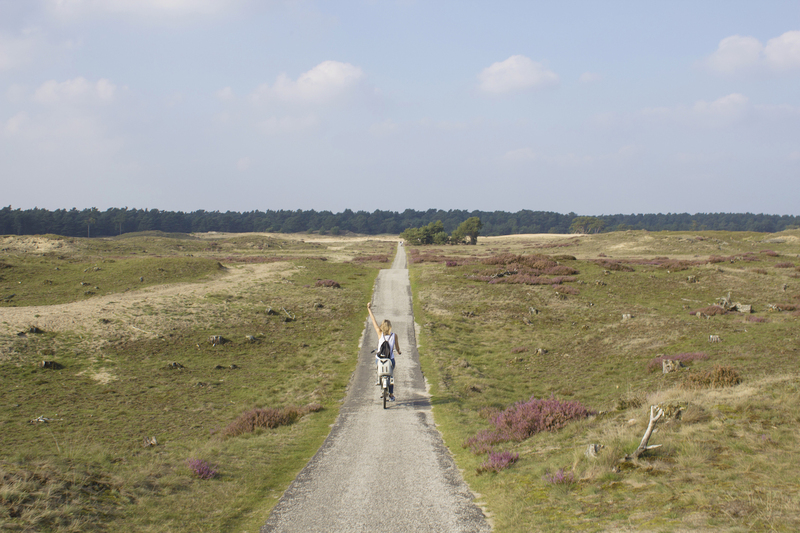 We cycled for miles, with the terrain changing from purple and grassy to yellow and dessert-like. We even saw a few deer along the way (can you spot them in these next two photos?!) This next one is just Kai ;) who unknowingly dressed to match the raspberry scenery! Having found the perfect picnic spot in the sun, we parked our bikes and settled in for a feast of meats, cheeses, fruit, dips, bread, and bubbles. We hung out in our quiet slice of the park for quite some time, enjoying the last of the season’s warm sun and each other’s company. Soon, the sun was sinking lower and lower in the sky, and as both of our phones had died, we figured it was time to try and guess our way back to the car! Luckily, there were a few major landmarks located throughout the park (such as ice cream stalls :) that helped us navigate our way back to the car. It was a truly magical day out in the Netherlands, filled with sunshine, art, nature, and relaxation. I loved that we got to spend an entire afternoon surrounded by nature, completely isolated from the rest of the world. If you’re interested in checking out the Kröller-Müller Museum, you can find their website here. 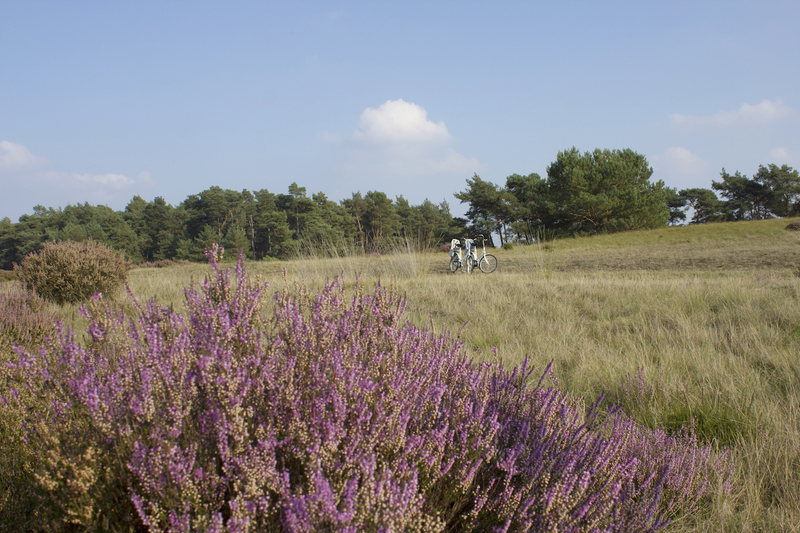 I highly recommend planning to make a day of the trek, so you can enjoy cycling around Hoge Veluwe National Park as well! 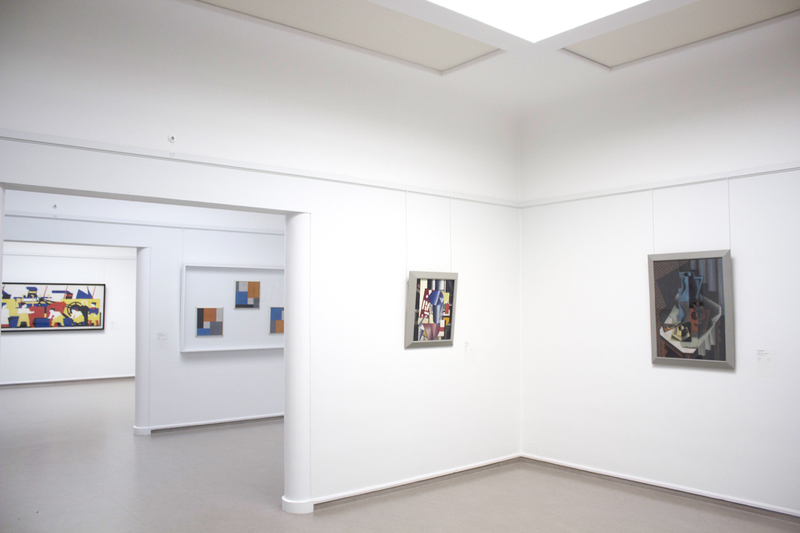 Hi, thanks for sharing your experience and amazing photos of your Kröller-Müller Museum visit. Keep sharing your wonderful trip experience and photos here.